On 21 February 2018 a CAM Interest Group meeting was dedicated to the benefits of Complementary and Alternative Medicine (CAM) for EU citizens with musculoskeletal disorders. The meeting was hosted by Sirpa Pietikäinen MEP. Speakers from academia presented how the holistic approach and practices of CAM can offer innovative, effective and cost-effective options for prevention and treatment of musculoskeletal disorders. This is highly relevant for European citizens and EU's health priorities because these disorders are the most common cause of occupational disease, and the economic cost associated to them is high (2% of European GDP). In addition to the economic cost, resulting from medical expenses and sick leaves, musculoskeletal disorders involve high social costs and significant reduction in workers' quality of life. EUROCAM therefore is strongly in favour of any initiatives aiming to evaluate the use of CAM in musculoskeletal disorders within the research frameworks of the European Union. Dr Dominik Irnich, assistant professor of anaesthesiology and head of pain medicine at the Ludwig Maximilians University (LMU) Munich, Germany. Dr Dominik Irnich, see above. Dr Holger Cramer, associate professor, Faculty of Medicine, University of Duisburg-Essen, Germany; Research Director at Department of Internal and Integrative Medicine, Kliniken Essen-Mitte, Germany. Dr Hugh MacPherson, professor of acupuncture research at the University of York, Department of Health Sciences, UK. Patrick van Dun, MSc, DO, Centre for Osteopathic Medicine Collaboration (COME), Belgium. 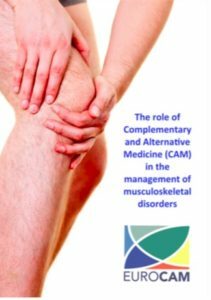 The role of Complementary and Alternative Medicine (CAM) in the management of musculoskeletal disorders - a EUROCAM paper.